← Did Nikki Haley write anti-Trump ‘resistance’ column? Who really burned down Brazil’s National Museum and why? TMR Editor’s Note: A likely arson fire burned “a vast and irreplaceable collection of what was by far the largest natural history and anthropology museum in Latin America. The majority of the 20 million items it contained were destroyed”. This definitive act of cultural terrorism was inflicted upon the nation of Brazil by the same forces who are destroying Venezuela…the Ukraine…Libya…Somalia…etc. Just who are those highly destructive and furtive forces? They are the very same NWO globalists who have transformed large swaths of the Middle East into a dystopian post-apocalyptic wasteland. They are also behind the advancement of the Greater Israel project in the Northern Levant, especially in Syria and Iraq. This manmade tragedy in Brazil is but a foreshadowing of things to come if the Brazilian people do not heed the warnings of the New World Order cabal. This faction of the power elite has gone crazy out of sheer desperation to establish a One World Government. They don’t realize that a ubiquitous Internet has short-circuited their foolish scheme forever. But you can’t tell them that. N.B. The following article offers some important details about the catastrophic fire in Brazil’s National Museum that will not be found in the mainstream media. 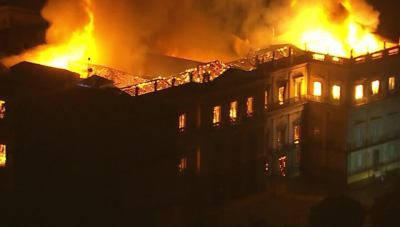 Brazil’s National Museum in Rio de Janeiro was gutted Sunday night by a massive fire that consumed not only the historic 19th century palace that housed the institution, but a vast and irreplaceable collection of what was by far the largest natural history and anthropology museum in Latin America. The majority of the 20 million items it contained were destroyed.